For the few newbies and novices I'll spend just a few words about this famous hi-end US-based Company. Krell is one of the golden names of the hi-end market and is renowned for designing and building top-notch no-compromise solid state electronics, with the aid of state-of-the-art technologies and components. Maybe the name Krell comes to mind immediately as soon as one thinks of high powered solid state power amps. Actually Krell Analog Inc. has a well-established tradition in making state-of-the-art power amps though it also makes excellent preamps, CD players, converters and even Home Theater components. Hence you can imagine how curious I was to test the brand new "affordable" little power amp from Krell, the KAV 150a. This power amp, together with its bigger brother KAV 250a (250 watts per channel), represents the first step into the golden world of Krell amplifiers, as it aims to reach a wider and more budget-conscious oriented public. The required amount of money (slightly more than 2,000 US $, in the US) has to be considered pretty low, given the high power of the KAV 150a (150 Watts per channel @ 8 Ohms) and the fact that its brothers are FAR more expensive. The KAV 150a has a pretty slim cabinet (48 x 37 x 9 cm) and one may wonder how they succeeded putting a serious 150 watts amp into such a compact-sized cabinet. The weight of the unit explains it all: the KAV 150a is quite heavy, indeed. The front panel has the classic Krell grey finish, with the Company logo in the center and the also classical electric-blue/violet led above the on/off switch. The quality of the finish is average and testifies where the major savings have been made. The rear panel is quite crowded: RCA and balanced line inputs, 12V for remote control inputs/outputs, single cheap-looking output posts for loudspeakers and a switch to "bridge" the KAV 150a, so to convert it into a mono 600 Watts power amp. The KAV 150a is very easy to use and seems solidly built. Once connected to my main reference system it has been tested under different situations and matched with different partners, over an extended period (several months). What's this? Uh, a 150 watts Krell power amp! I hear you saying: "OK, big, dynamic and full-bodied sound, powerful bass and..." and you're quite wrong. The first thing one notices when the KAV 150a is driving the loudspeakers is the grace and the kindness he has and the way it offers the Music to the listener. It is like a sweet cat who loves caresses and is always ready to...bite. It is suddenly clear it is a 150 watts power amp, no doubt about this, but this large amount of power is delivered with ease and grace, there's no trace of aggressiveness in the sound of the KAV 150a. Sonically neutral and balanced it possesses an open high range, refined and accurate without the harshness of some other cheap hi-power amps. So is the mid range: natural and distortion-free, able to reproduce without harshness even the most difficult female voices. Actually, one of the best things this amp is capable of is reproducing male and female voices very naturally, without compressions or excessive sibilants. Then there's the bass range, the famous Krell bass range. Well, the little KAV 150a does what it can to give us an idea of what the Krell bass range actually is. It is powerful and articulated but it clearly lacks the depth and the "breath" of its bigger brothers (sound pretty obvious, uh?). Some extra "drive" at the lower frequencies would be welcomed, indeed. You should already know I'm a big fan of below-40 Hz frequencies as my favourite musical instrument is the pipe organ. Well, as said above, the KAV 150a is like a sleeping cat: you can caress it but you should be always prepared for a "bite". So, when the musical program requires impact, the KAV 150a shows you all the dynamic power it possesses, transferring large amounts of sheer energy to your drivers and to your body. It does not sound violent: the energy is offered quite gently, which is quite unexpected for a hi-power solid state amp. It sounds dynamic but not exactly explosive, it is powerful but not aggressive. It is possible to listen to it for hours and hours, at high levels, withot ear "fatigue", a clear sign of class. In fact, you know when you're testing a good amp when after 4 or 5 hours of listening at high levels you can still turn the volume up without willing to turn everything off instead. The driving capabilities of the KAV 150a are good, it can virtually "shake" any driver, even the laziest one. Even in large rooms, with mid-efficiency loudspeakers, the amount of power is more than sufficient for adequate home listening sessions. The KAV 150a is very good at microdynamics, too. Not exactly "analitycal" or "razor sharp", it still unveils good amounts of tiny details and variations, though its ability to sound with grace makes it sound smoother than it actually is. The sense of speed and pace is average: it follows the Music with ease and attacks and decays are natural, withot being too "sharp" and violent. There's much air among the instruments and the illusion of a 3D event is very realistic. Not the soundstage of the top-of-the-line Krell amps but still a good performance, given the price. The sound is NEVER "in the face" as is usually expected with hi-power solid state power amps. The KAV 150a requires just a small amount of warm-up, even after 10 minutes it is able to deliver the 90 % of its performance. The sound changes a bit after a couple of hours but to a small extent. It is an easy amp to match with different components: it is not a "primadonna" so it feels comfortable both with tube and solid state preamps. I suspect it prefers to drive traditional dynamic loudspeakers but it can easily drive anything. Even the choice of the cables is easy but just let me spend a few words about the power cord. With audiophile power cords the sound of the unit changes, the overall dynamics and punch improve but one should pay attention not to destroy the inner tonal balance of this amp. The choice of the power cord is not an easy task. This leads me to suspect the reason why Krell suggests not to change the stock power cord supplied with the amp. Probably the sound of the amp has been "adjusted" using the stock power cord and every attempt to change it can alter the equilibrium of the unit. Somehow it is the same thing that happened during the listening tests of a pair of Linn electronics. So, if you want to "tweak" and improve a little the sound of this KAV 150a you should carefully choose the right power cord for it. Finally, the KAV 150a is not a 100 lbs monster so placement can be easily achieved even via a standard audiophile rack (see for example our DIY FleXy table) or, also, placing the unit directly on the floor. From a craftsmanship point of view the finish of the KAV 150a looks quite cheap and the front panel appears to have pointed edges that should be always avoided in home-aimed components (children touch everything...). Even the output binding post are quite cheap looking. From a purely sonic point of view I'd have preferred a more powerful lower end and a punchier sound. Grace and power live together in harmony here. The KAV 150a is the first step into the golden world of Krell amps and it should be seriously considered by anyone who's searching for a powerful amp with a gentle sound. Also, you may wish to test listen to it if your're the kind of audiophile who thinks that hi-power solid state amps do all sound the same. 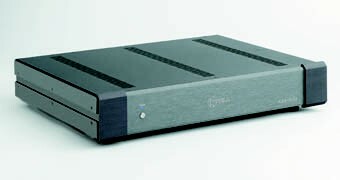 A huge thank you to the Audio Natali staff, the Italian distributor of Krell electronics for having sent us this amp for reviewing.